Bedroom is your personal space more than just a place to sleep. Nothing feels comfortable than relaxing in a warm, cosy, romantic and peaceful room, laying on the bed comfortably listening to music or reading a novel, while having a cup of coffee or tea. You may want to give a rest for your feet after standing on them whole day. Bring your bedroom to life with Saltillo Tile Flooring. Saltillo tiles are made from durable clay that only exists in the Mexican city of Saltillo, Coahuila. Since they have been created naturally by exposing for occasional dog prints, chips, bumps, hairline cracks, lime pops etc. they have very unique designs and color variations which cannot be seen anywhere else. Do you want to make your bedroom like a vacation spot with exotic Mediterranean look? Saltillo tiles for Manganese finish has those warm colors varying from light browns to dark brown included in terra cotta color range. This finish is excellent for both modern and rustic bedroom and you can customize your desired look by painting the walls and furniture accordingly. Whether you want a marble, vintage, Mediterranean or modern look you can achieve any of them by simple additions to your Saltillo tiled floor in manganese finish. If you love for a romantic ‘old world’ style bedroom consider choosing Saltillo tiles in Antique finish that has much darker colors and a rough texture which gives a stone effect. You can enhance the look by adding black grouts for your Saltillo bedroom floor and some dark furniture with a large canopy bed. Consider consulting an expert if you need more help in designing you bedroom. Your living room is the place for conversation with friends in your home. The natural warmth of Saltillo tile makes a cozy space to relax, watch Television, and host family gatherings and parties for friends. 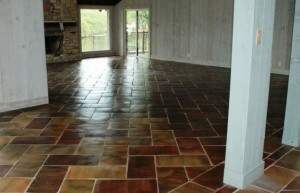 Bring the unique charm and beauty of Saltillo tile flooring to the center of your home where life happens. Being a high traffic area, which needs cleaning very often, you need to be careful about the durability and ease of cleaning of the tile you going to buy for your living room. Fortunately Saltillo tiles offer a great value to your money by being the best all rounder in fulfilling all your requirements. If you love to give a luxurious Spanish feel consider choosing Antique style Saltillo and decorating your living room with stone walls and wooden beams. If you rather prefer for modernized colorful living rooms, choose Saltillo tiles in Manganese Finish, which are great for highlighting your colorful décor with their beautiful light and dark brown shades. For a simple and natural feel at your living space, select Traditional terra cotta Saltillo tiles followed by dark wooden furniture and walls in neutral color. For a perfect fit, choose the correct size and shape from our large collection. Our large Hexagonal tiles are ideal for large living rooms with large sized furniture. They are available in different sizes and thicknesses making every space beautiful. If you have a little space for your living room try our small sized Saltillo tiles which are specially designed to enlarge the space. For a bolder design, install a hand-painted Talavera tile insert in your Saltillo tile design.